A settlement has been reached in connection with a Roman Catholic priest accused of sexual abuse. At least six adults claimed father John Powell abused them in the late 60's and 70's. 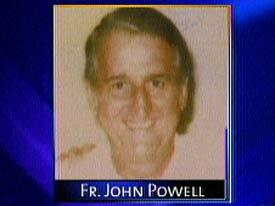 No criminal charges were filed against Powell but the priest has admitted to the abuse. Two of the former Chicago Jesuit priest John Powell's victims spoke out Thursday. Patrice Regnier says Father Powell -- a former Loyola University professor -- started abusing her when she was 12 years old. She just received a settlement. "The idea people found from me speaking the truth that they could come out themselves and speak the truth is a good thing," said Patrice Regnier, victim of sexual abuse. Diane Ruhl says she was abused at 17 years old by Father Powell on the Loyola campus when she was a student. She confronted him 30 years later by writing him. He responded and admitted to the abuse in his letters. "He told me that it was to awaken my sexual identity and because I was vulnerable and naive and he was well known and spoke about love, I believed him," said Diane Ruhl, victim of sexual abuse. Father Powell is now retired and living in a retreat run by the Jesuits in Michigan. He is also a nationally known author and relationship expert who has published over 30 books on the subject of love. "He began his exploitation of children in the 60's. The Jesuits have known about it for a decade. They exalted him, honored him with degrees," said Attorney Jeff Anderson, victim's attorney. Father James Gschwend of the Chicago Province of the Society of Jesus says Father Powell is not well. "I'm sorry it happened, I'd do everything I could to encourage somebody into therapy," said Father James Gschwend, Chicago Province of Society Of Jesus. The attorney for the victims -- Jeff Anderson -- says he is representing nine women who claim to have been sexually abused by Father John Powell. One of the victims said another seven women have come forward to her once they learned of her lawsuit. The organization SNAP says two other women have come to them.